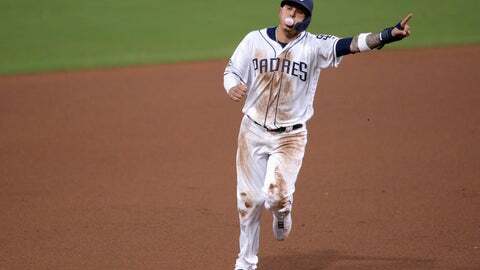 SAN DIEGO (AP) — Manny Machado was called out on batter’s interference after dropping his bat near John Ryan Murphy while the Diamondbacks catcher tried to catch a popup, a disputed decision that led to Padres manager Andy Green’s ejection. Machado appeared to brush Murphy as he broke out of the box in the sixth inning Tuesday night while Murphy moved to catch a popup about 10 feet down the first-base line. As he ran by, Machado tossed down his bat toward Murphy’s feet, though the bat did not touch Murphy. The catcher dropped the pop foul, but plate umpire Bill Welke signaled for interference and called Machado out.